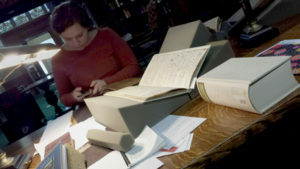 Madeline Gray researching at the Folger Shakespeare Library in Washington, D.C.
History graduate Madeline Gray ‘18 worked alongside Dr. Anne Good to complete 18th century research for her senior thesis, specifically focused on the history of food during the period. Together, Gray and Good will present their research on Feb. 13 at the first Community Gathering of 2019. Posted in Academics, Alumni, Campus Life, Community, Faculty & Staff, Feature 1, History, News & Events, Students and tagged alumni, Arts and Humanities, Center for Innovative Teaching and Engaged Learning, CITEL, Community Gathering, Dr. Anne Good, Folger Shakespeare Library, Goizueta Foundation, history, Madeline Gray, Washington D.C.